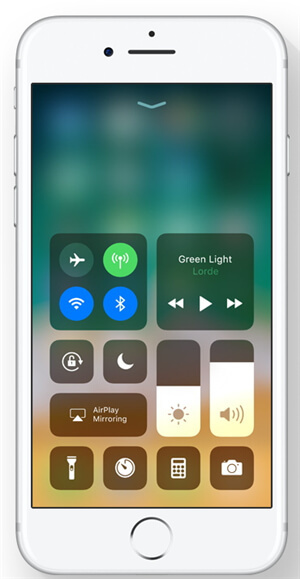 You’re excited to finally try out the iOS 12/11, to sample the new features Apple announced. You’ve painstakingly done the upgrade and wait for your phone to reboot so you can see for yourselves what Apple CEO described back in June. Alas, your phone fails to come on. You’re almost going into a fit. Come on! You exclaim. Is your iPhone damaged? Can it be repaired? You are scared, you grab your computer, you search Google for “iPhone won’t turn on after update” and here you are. This post will holistically look at the reasons iPhone might fail to turn on after an iOS upgrade, and give easy to follow tips and steps to bring back your iPhone to life. Let’s begin! You’ll be surprised how many people have been thrown off guard by this reason. Many issues can result in your device’s battery quickly running out absent your knowledge. Maybe your device’s battery wasn’t fully charged when the upgrade process began, or the upgrade process ran the battery down or quite simply a faulty battery. Yes, you might have been pretty certain that you had ample battery on your device prior to running iOS 12/11 upgrade, but let’s make sure we troubleshoot battery first. It’s worth checking. So, pick up your lightning connector – you can try another lightning connector, port and outlet, just to be triple sure – plug into your charging port and into a power source and leave it for some minutes, preferable an hour. You should drum the bells if your device comes on. If not, time to try another trick. Now that we have knocked off battery as a potential culprit, the next step is to try a hard reset to see if the problem was just iOS crash. Whether it’s just not turning on, or it doesn’t boot, or the screen is just frozen, a hard reset can be the emphatic answer. It might just be some bad data bits that needs to leave the device’s memory, and why not if it might work for you. A hard reset is perhaps the easiest, often-used and most straightforward solution to iPhone problems. Simply press the “Home” button and the “Sleep/Wake” button together and hold down till you see the Apple logo – this should not take more than 10-15 seconds. If the logo appears, great! If not, then on to the next step. You can’t get tired now...your device is counting on you. Your device’s firmware is the part of your operating system responsible for control, monitoring and data manipulation. If it’s cracked, then it needs to be patched. A corrupt firmware is possible after an iOS upgrade if the upgrade process is not done properly. Restoring your device via iTunes can seem daunting, but relax, we are going to break it down for you. We recommend iTunes because it is easier and more straightforward than the iClouds option. iTunes takes care of offloading the corrupt firmware, reinstalling a new operating system (the one in your backup) and reloads all your settings and data. This will most likely take care of the bad bits we mentioned earlier. For this to work, your device will have to be functional, that is, no hardware issues (we’ll get to that soon). It might not boot directly, but it should appear on iTunes for this step to work. Steps: 1.Plug your device – iPhone, iPad, iPod touch, with iTunes running on your computer with an Apple authorized lightning connector. 2. Click on the tab on the top left of your iTunes screen. 3. Make a backup by clicking on “Backup” and wait for it to compete without disconnecting your device. 4. Once done, click on “Restore”. You can restore from the just completed backup, or select an earlier backup. Wait for the process to complete. The hardest part is the waiting part – waiting to see if it works. And I’m rooting for you right here too! This method is for those who have made a prior backup of their device before iOS 12/11 upgrade issues, as this method will wipe every settings and contents off of your device. Steps:1. Connect your lightning connector to your device – just your device. 2. Connect your device to your computer while pressing down the “Home” button of your device. 3. Run iTunes. Your phone will now be in recovery mode. 4. Follow the on-screen prompts to restore your device. DFU means Device Firmware Update. What you’re basically doing is telling your device not to load the main OS, but in an “awake’ state enough to interact with iTunes from where you can restore your device to an earlier state. Steps:1. Connect your device to your computer via the lightning connector cable. 2. Hold down the “Sleep/Wake” button for about 3 seconds and then release. 3. Now, hold the “Sleep/Wake” button you just released together with the “Home” button for about 10 seconds. 4. Release your finger from the “Sleep/Wake” button, while holding on to the “Home” button for an extra 5 seconds. 5. When your screen remains blank, then, the DMU mode is in effect now. Complete the restore process by following the prompts in iTunes. 4. Fixing the Underlying Causes of "iPhone Won’t Turn on"
iMyFone Umate Pro is fully compatible with iOS 12/11 and receive lots of positive reviews from macworld.co.uk, Makeuseof.com , Cultofmac.com etc. Step 1: Install the iMyFone Umate on your computer and link your iPhone to it. Step 2: Go to “1-Click Free Up Space” tab and hit “Quick Scan” button. When it finishes, you will see how much space can be cleaned on your iPhone. Step 3: Hit “Clean” button of Junk Files and it will start cleaning. 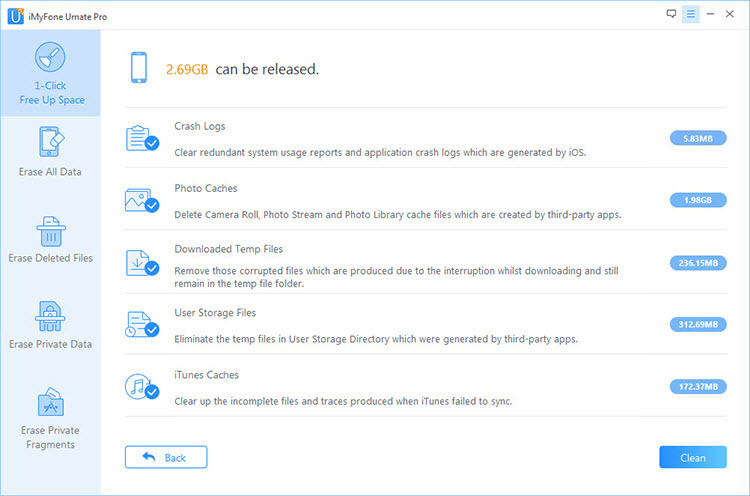 Delete temporary files: Get rid of temporary files such as caches, corrupted files, etc and improve your iPad performance and prevent future freezing of your iOS devices. Compress iPhone photos: Save space by taking 75% off your photo sizes without losing the picture quality one bit. Mass delete photos, apps, and videos: Batch apps, photos, and videos for delete and save yourself from the inconvenience of manually doing it. 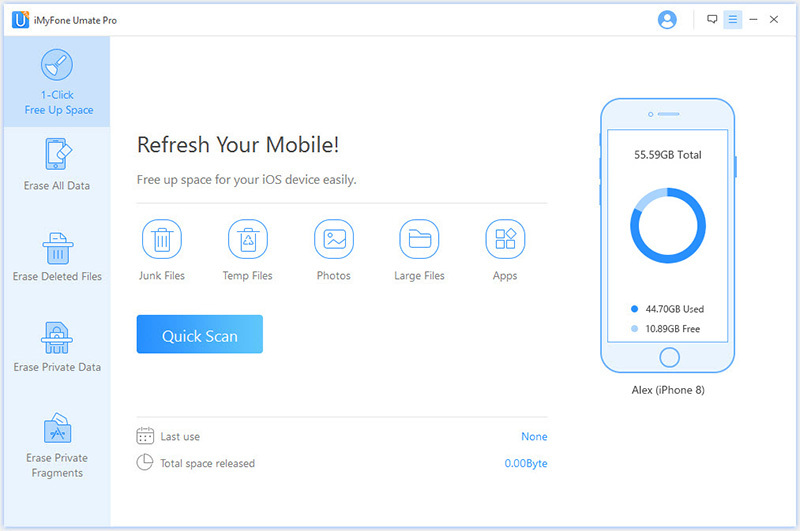 Erase deleted files: Scan and preview files you’ve deleted even before using Umate Pro and erase them permanently. Erase Private files: Get rid of files such as contacts, memos, voice notes, photos, and other private and personal information on your device safely and permanently. Erase WhatsApp/WeChat data: Completely erase all the WhatsApp/WeChat messages and media files you’ve received from friends and groups and create more space for yourself. Erase all data: Erase everything on your device permanently except of course the operating system. When all the above solutions have failed, the last resort will be to contact Apple support. The problem of "iPhone not turning on after update" is most likely a hardware issue.